Uber says it will cease operations in Quebec next month if the province doesn't back down on new, stricter rules regulating the ride-hailing service. Uber is threatening to cease operations in Quebec next month if the province doesn't back down on new, stricter rules regulating the ride-hailing service. 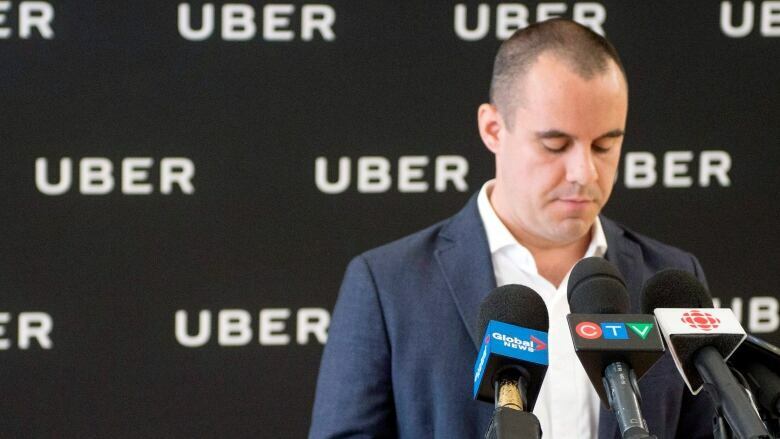 Jean-Nicolas Guillemette, director general of Uber Quebec, said the service will shut down Oct. 14 if nothing changes. On that date last year, the two sides agreed to a pilot project that allowed the ride-hailing company to operate. Quebec Transport Minister Laurent Lessard agreed to renew that pilot project last Friday, but with stricter conditions including a requirement that drivers undergo 35 hours of training, the same amount as traditional taxi drivers. Guillemette said Tuesday Uber wasn't consulted about the changes, which they consider to be major, and that the requirement is too much for drivers who only work part time. "What the [Transport] Ministry has announced is an attempt to impose old rules on a new technological model," he told a news conference. Quebec is the only Canadian jurisdiction where Uber operates that requires drivers to do training, he said. The government also wants Uber drivers to have criminal background checks done by police, instead of private companies that do them now, and have their cars inspected every 12 months. Guillemette insisted the company doesn't want to negotiate through the media. He told reporters he wants Quebec to renew the original pilot project with the old training requirements, and resume negotiations afterward. What's in the original Uber deal? This isn't the first time Uber has threatened to leave. Last year, Guillemette said if the government regulated the company as it regulates taxis, Uber would have to shut down. Montreal Mayor Denis Coderre, who is running for re-election Nov. 5, said he took issue with Uber's bullish ways, saying the company is "condescending" and has attitude when it doesn't get what it wants. Coderre said he felt cynical when he watched Guillemette's announcement this morning, which he noted was soft in its delivery but "the message remains the same." He sees it as a bargaining chip and said Uber doesn't want to increase its training because it doesn't want to have to do the same in other cities. "Bye-bye, I don't care," Coderre said on CTV, later repeating the line and explaining during the news conference that "that means, don't threaten me." "If you want to threaten me, I've got some Irish blood. I'm sorry, I mean, I've got my own way." He said 15 extra hours of training that could be done online should not be a big deal, suggesting drivers split the 35 hours into seven sessions of five hours each. "I mean, with all the time that we're passing on Twitter and Facebook," Coderre said. "If they're against that kind of training, well, I'm sorry, but tough luck. I'm not gonna cry, I'm not gonna lose any sleep." Lessard, the provincial transport minister, reacted to the announcement Tuesday at the National Assembly, telling reporters, he's not backing down on the new rules, but that he's open to drivers being able to take the training online. "Honestly, I'd be very surprised that a big company, a multinational that developed an application like this, is not able to up the ongoing training of its members," he said. "We're not in negotiations mode, we did that last year," Lessard added, noting that there had been several instances during the pilot project with Uber drivers not conforming to the original rules agreed upon. Guy Chevrette, spokesperson for the Quebec taxi coalition, said Uber is pulling out of Quebec would mean more government interest in helping the traditional taxi industry modernize. But he said he's not ready to claim victory yet, pointing out it's possible the company is using the threat of leaving as leverage. "All their profits were made illegally, and on the backs of people who legally, bought a very expensive permit that was devalued, I would say in some cases by 50 per cent," he said. Since UberX, which allows non-professional drivers to shuttle passengers around in their own personal cars, arrived in Montreal in 2014, the service has been met with opposition from politicians and taxi drivers alike. But the conflict ramped up in earnest last year, as the taxi industry increased its efforts to force the province to act. Quebec's taxi drivers have been vocal against Uber, saying the government's agreement to even have a pilot project amounts to a betrayal. 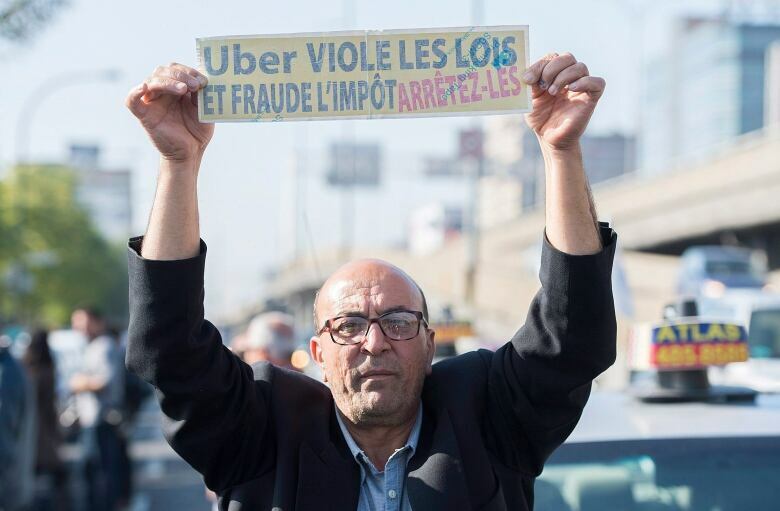 They blame Uber for what they say is the decreasing value of their taxi permits, which can cost hundreds of thousands of dollars, and have held protests in downtown Montreal, using their cars to block busy city streets. London's transport regulator on Friday stripped Uber of its licence to operate, affecting over 40,000 drivers in a huge blow to the taxi app. The company is appealing that decision. Markus Giesler, a marketing associate professor at the Schulich School of Business in Toronto, said he doubts Uber will follow through on the ultimatum. It's made similar demands in other cities and is still operating in them, he said. Giesler looked at how Montreal consumers were reacting to the news on Twitter and said he was surprised to see many in favour of it leaving. "There's something to be said about this company that is being perceived as an intruder, not only from the commercial standpoint, but also culturally," he told CBC News. "We might expect a company that wants to make business in Canada to be a little more polite." Matthieu Visser is a full-time Uber driver, and is convinced the company has improved Montrealers' quality of life. He said the option of taking an Uber has prompted people to ditch their cars and helped them cut costs. As far as Visser is concerned, the requirement to do 35 hours of training is too strict, and he doesn't think he and his fellow drivers need it. "In 2½ years, we've had so many storms inside this battle. This might be a big, big storm. Maybe it's the last one, maybe it's the end. I don't know." A previous version of this story stated that under last year's pilot project, Uber drivers had to undergo 20 hours of training, based on comments from the transport minister. In fact, the pilot project forced Uber to train its drivers and made drivers pass a 4C licence test, but there was no government-mandated number of training hours.